Girls at a church-run children's home were routinely drugged, locked up and physically, emotionally and sexually abused, a review has found. Hundreds of girls were sent to Kendall house in Gravesend in the 1960s, 70s and 80s, before it closed in 1986. 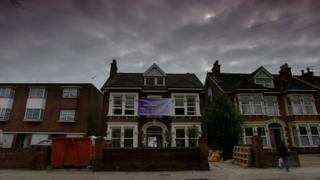 The independent review set up by the Bishop of Rochester said the home was a place where cruelty was normalised. It found girls were heavily sedated and placed in straitjackets. The Church of England has apologised. In a report the inquiry team said: "The findings are harrowing." The home was "a place where control, containment and sometimes cruelty were normalised." The review found girls as young as 11 were "routinely and often without any initial medical assessment, given antidepressants, sedatives and anti-psychotic medication". Drugs were administered in dosages exceeding usual prescribed adult levels to control girls' behaviour, placing them in a constant stupor, and restricting their ability to communicate, the report said. The review found: "The effects of the drugs also increased their vulnerability to emotional, physical and in a smaller number of cases, sexual abuse". On at least two occasions girls were placed in straitjackets and others were threatened with transfer to a local mental health hospital, the report said. So much abuse has been uncovered in recent years, we are in danger of becoming impossible to shock. Then you read about what happened in Kendall House. Consider this line from the inquiry: "We have found that every former resident…was in fact the victim of abuse." And: "Concerns about the medication regime at Kendall House were raised in the 1970s and 1980s. All were either ignored, rebuked or belittled." Long-term institutional abuse on young vulnerable girls was perpetuated by staff and tolerated by the Church of England. The Rochester diocese, already in financial difficulties, is now going to pay compensation to the women they so singularly and inexplicably failed. The consequences of the abuse however may be even more widespread than the inquiry concluded. At least one former resident maintains the drugs forced on her led to birth defects, something the inquiry did not investigate. Launched by the Bishop of Rochester, the Rt Rev James Langstaff, the review chaired by Professor Sue Proctor, who led the inquiry into Jimmy Savile's abuse at Leeds Teaching Hospitals, found the abuse had led to many "broken lives". She described the Church's initial response to allegations about Kendall House as "woeful" and inadequate" and said the administration of powerful drugs appeared to have an "experimental approach". The report said: "The evidence we have heard and read during this review tells of a place which was, on the whole, toxic and destructive to the girls placed there." In 2009, Teresa Cooper told BBC Radio 4's Today programme she was given major tranquilisers, anti-depressants and drugs to counteract side-effects while in the children's home. The programme found 10 ex-residents at Kendall House had gone on to have children with birth defects after being forcibly given cocktails of drugs, including tranquilisers, during the 1970s and 80s. In 2010, Ms Cooper agreed an out-of-court settlement with the Church of England, which did not accept liability. The review recommended the dioceses of Rochester and Canterbury make payments to all former residents who took part in the review. Bishop Paul Butler, lead bishop on safeguarding for the Church of England, said: "The appalling standards of care and treatment should never have been allowed. "On behalf of the national church I apologise unreservedly to all the former residents whose lives were and continue to be affected by their damaging experiences at Kendal House." The Bishop of Dover and Canterbury, the Rt Rev Trevor Willmott, said the Church would act on the report's recommendations speedily. He said: "It is clear that we failed. We know words cannot undo the failings of the past, but I would like to echo both Bishop James's apology to former residents of Kendall House."